Last weekend history was made in Bucharest, Romania as the first ever European Jiu-Jitsu Brazilian Championship reserved for European citizen only took place. It was attended by around 400 athletes from 14 countries. Up to now, other European championships (Ibjjf and other) have mostly Opens that accept competitors from all countries. This means that these competitions were actually an Open championship and therefore shouldn’t be called ‘European’ championship. The tournament was organized by the WBJJA (World Brazilian Jiu-Jitsu Association) and was using the revolutionary Smoothcomp software which ensured that it was running smoothly and on time. In 16 years of the IBJJF European Open in Lisbon, only 2 Europeans have managed to win the gold medal in the male adult black belt division. The first, after 7 years, is Alexander Trans. He won in 2012, 2013 (category) and 2014 (absolute division). The second, after another 3 years in 2018, was the Portuguese Manuel Pontes. In 2004, 2005, 2006, 2008, 2009, 2010 and 2011, the podium was exclusively won by athletes from Brazil, athletes who deserve credit for their qualities and the effort to travel to as many events as possible, increasing the technical value of a BJJ practitioner. The Open format competition gives the athletes the opportunity to compete with high level Brazilians athletes, who give the European Open similar level as the world championships in California. But, right now, it’s about the best competitors on the continent: The European ranking. 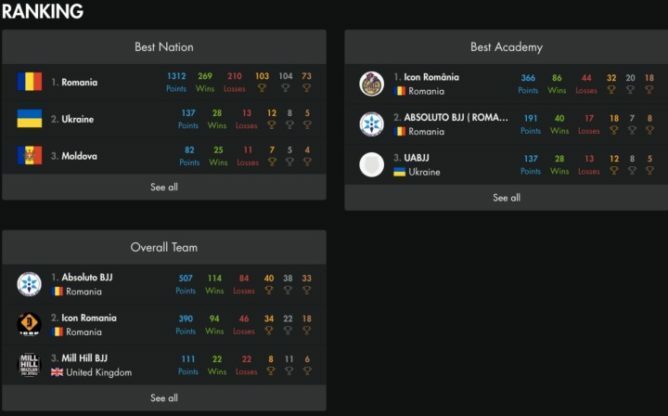 In this first ever real European championship, the exact number of the participants from outside Romania, was 74. “Last weekend, the European Jiu-Jitsu Brazilian Championship took place, attended by around 400 athletes from 14 countries. The event went smoothly using smoothcomp, and as an organization level, for us, it was an event that we made of passion and passion from which we learned a lot. I think we missed a few things in some places, but I hope they did not affect the smooth running of the competition. I hope that soon we can edit the filming of the 4 mattresses we can post. We are at the beginning and want to continue. We enjoyed the high number of athletes in Romania who believed we could do that, we enjoyed the support of the athletes from the other participating countries who, while participating for the first time at an event organized by a new entity, did the effort to get to Romania to fight, even for one match, there or medal, where there were not enough participants in the category. We are grateful for this athletes, coaches, referees and staff who formed the team of the event and without which this event could not have taken place. We are now starting to work to grow organizing staff. 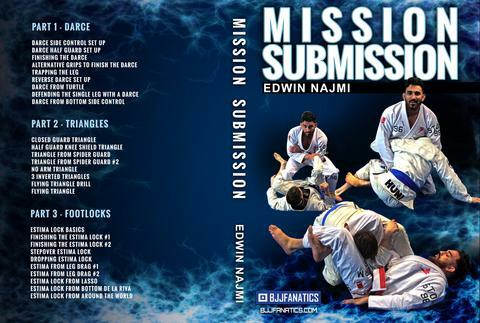 Start To Attack Submission From Every Position With One Of Today’s Most Submission Oriented Fighter, Edwin Najmi: Estima Locks, Darce Chokes, Flying Triangles, Guillotines and more. Attack from EVERYWHERE. Edwin Najmi is one of BJJ’s most exciting fighters today, why? He always attacks the submission.